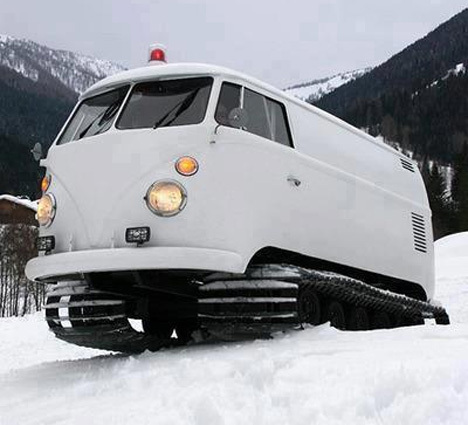 If you have a need to make a truly badass impression, there is no better way than driving around in this VW Transporter that’s been turned into an all-weather, all-terrain tank. But this beast doesn’t just get you to your destination in jaw-dropping style; it can turn any parking lot into an impromptu party in minutes. The Frankenstein-esque bus features an automatic pop-up top and a robust sound system. It can be used for parties or public gatherings, or wherever a really loud sound system in a very attractive package would come in handy. 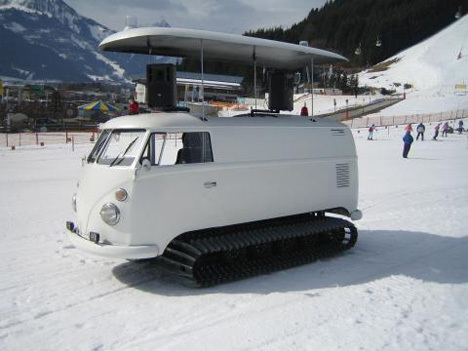 The project was achieved by Austrian promotions company BB Support by combining an old VW Bus T1 and a 1960s Bombardier B01Spurgerät snow machine. BB Support had the idea for the crazy vehicle back in 2005, but it took quite a while to actually put the plan into action. 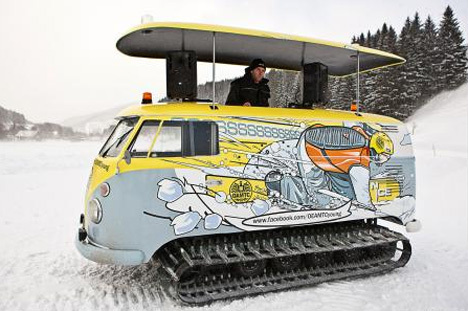 After clients began to show interest in using a mobile DJ machine with the body of a beloved Volkswagen, the team put the two vehicles together and made one of the most beautiful mash-ups the world has ever seen. See more in Mods & Custom or under Transportation. April, 2013.